San José, CA – April 30, 2012 – May is Asian American Heritage Month and History San José will host a spectrum of activities at History Park on Sunday, May 20, from 11 a.m. to 4 p.m.
To celebrate May as Asian American Heritage, and in partnership with HSJ, San Jose Taiko’s youth program, the Junior Taiko Performing Ensemble, will perform at 2 PM. 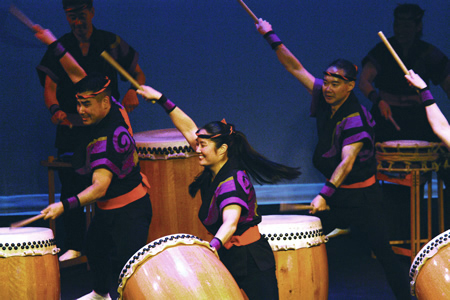 There also will be Samarai hat-making, Vietnamese lanterns, Chinese drums and more. Also Dig Into San José’s Past with Stanford Archaeology Center students at History Park. The students will assist visitors by conducting a mock excavation, screening, artifact identification and artifact reconstruction. This family educational program will allow individuals to collect stickers for each activity to place in Archaeology Passports and become ‘certified’ as a Junior Archaeologist. The trolley will be available for a ride around the park, as well as handcar rides. Other activities will include visits to the Print Shop and live music by Fiddle Road throughout the afternoon. Making fish kites will help celebrate Japanese Children’s Day, and Chinese dragon hats will coincide with the reading of Chinese folk tales, such as Tales of a Chinese Grandmother. Coincidentally, this year on May 4th marks the 125th anniversary of the fire that destroyed downtown San José’s Chinatown, where today’s Fairmont Hotel stands on Market Street. John Heinlen, a local businessman, braved death threats to lease property to the displaced Chinese people at Taylor and Sixth Streets. It then became known as Heinlenville, in what is today’s Japantown in San Jose. As affiliates of History San José, the Ng Ching Gung of the Chinese Heritage Cultural Project (CHCP) and the Immigrant Resettlement & Cultural Center (IRCC), the Museum of the Boat People & Republic of Vietnam , located inside History Park, will be open.